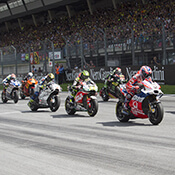 For the pinnacle in motorcycle racing, BetStars has odds on each race of the Moto GP world championship which has produced legends like eight-time champion Giacomo Agostini, Valentino Rossi and more recently Marc Marquez. To get the most from your MotoGP betting and other motor sports, check out our tips with the latest odds from one of the world’s most exciting and dangerous sports. The 2019 MotoGP season begins on Sunday with the Qatar Grand Prix and several riders will be hoping this can be their year. Marc Marquez was crowned champion in 2018 after finishing 76 points clear at the top of the standings but has several rivals looking to steal his crown.